February 21, 2013 - Health care is becoming more patient focused, with patients expected to assume greater responsibility for their health and to rate their satisfaction with their care. So what do patients value and how can nurses deliver on it? Deb Rivituso, RN, reported that medical negligence cases often involve a lack of communication. Deb Rivituso, RN, a nurse consultant at the law firm Pegalis & Erickson in Lake Success, N.Y., agreed, saying, “I think patients want to be in a caring and professional environment where they feel they are being heard, where communication is open and where they feel safe.” She reported cases of medical negligence all too often include a lack of communication between medical professionals and patients, and between medical professionals themselves. Safety is of primary concern to patients and providers, and clear communication is a key factor in ensuring safety. Patients want an experience similar to what they expect from other service industries, added Nick Angelis, CRNA, MSN, author of How to Succeed in Anesthesia School (And RN, PA, or Med School) and a nurse anesthetist in Pensacola, Fla.
Research bears out the importance of compassion and communication. Communicating with Patients on Health Care Evidence, a September 2012 white paper from the Institute of Medicine (IOM) Roundtable on Value and Science-Driven Health Care, reported that more than 80 percent of people surveyed expressed the desire for their provider to listen to them, but only 60 percent indicate that happens. Less than half of the 1,068 respondents reported their provider asked about their goals and concerns for their health and health care. Patients who felt their providers listened to them and asked about their goals were 3 to 5 times more satisfied with their providers than other patients. The IOM study also found 80 percent of patients want to hear the full truth about their diagnosis, 70 percent want to understand treatment risks. “The voice of the customer may be the best kept secret in health care, but that’s changing as consumers exert greater control over how their health care dollars are spent and exercise power to vote with their feet and wallets,” said Kelly Barnes, leader of U.S. health industries, PwC, in a written statement. While good communication reflects good nursing or medical care, one cannot forget why people are meeting with a health care professional in the first place. Sue Neville, PhD, RN, said safety is of primary concern as the complexity and acuity of care is continually increasing. They want the health care system to restore them to health when ill and they want that to happen immediately, even those who have delayed seeking care, reported internist Allan S. Detsky, MD, PhD, a professor at the University of Toronto, Canada, in a 2011 commentary in the Journal of the American Medical Association (JAMA). That being said, Detsky also reported that patients want to be treated with kindness and empathy, and they want hope. While in the hospital they want their own room, and they want the best physicians, based on testimonials from people they trust. They want certainty and active strategies. The PwC report found 57 percent place a high value on the patient education they receive during a visit. And 65 percent of consumers want to exchange information through online and mobile channels of communication. Angelis, on the other hand, added that many patients want quick fixes not requiring diet or lifestyle modification. January 25, 2013 - Nurses are compassionate people; it is the very nature of their jobs and what drew most of them to the profession. Yet, even for the most caring and compassionate of nurses, sometimes the length, duration and severity of the interactions they have with patients, every day, can take a toll. When this happens, and compassion fatigue occurs, there are some things that nurses can do to help put themselves or their colleagues back on track to serve patients passionately and with renewed energy. Compassion fatigue is prevalent in most every health care profession, noted Jude Bijou, MA, MFT, a psychotherapist, professional educator and workshop leader based in Santa Barbara, Calif. “I believe that it is due to having so many unexpressed emotions about all of the interactions, all of the heartbreak, fear and frustration that is part and parcel of witnessing and serving people at times when they are often at their most vulnerable,” she said. Kathy Ault, director of pastoral care at Mercy Medical Center in Baltimore, Md., agreed. “I think the prevalence of compassion fatigue is very high among all caregivers,” she said, including nurses, physicians, chaplains and others whose role involves taking care of people who are going through a lot of suffering, pain and loss. Because compassion fatigue is so common--and can affect both the caregiver and the level of care they provide--it’s important for nurses and their managers to be able to recognize the signs. Eyre agreed and added that she and her colleague, Lombardo, work with managers to help them be alert to the signs so that they can intervene. Managers have an important role to play here, she noted, because those who are affected by compassion fatigue are generally not able to spot the signs in themselves. There are a number of things that health care organizations, their managers and staff members can do both to minimize the impact of compassion fatigue and to address it when it occurs. The health care organization can and should take a role in helping to address and relieve compassion fatigue, said Ault. In her work at Mercy Medical Center, she starts this process during orientation. “As we’re bringing new nurses into our system, we take an hour at the end of their orientation process to do a reflection in our Chapel of Light.” During that process she takes them through a guided imagery exercise as a means of providing some tools that they might use in their daily living. The medical center also does periodic symposia for nurses throughout the community focused on the concept of mindfulness and the importance of caring for themselves. Case Medical Center is also focused on providing a variety of resources for staff to help them deal with compassion fatigue, said Eyre, and they encourage staff to think creatively about how to address their own needs and those of their colleagues. As an example, one of the nurses at Case recommended having a room where nurses could go to decompress. While space was at a premium, a spot was found and converted into a quiet respite for all staff on the floor--from nursing to environmental services. It’s a “no phones allowed” place, designed not to catch up on phone calls or email, but literally to relax with soothing surroundings and music. Copyright © 2013. AMN Healthcare, Inc. All Rights Reserved. 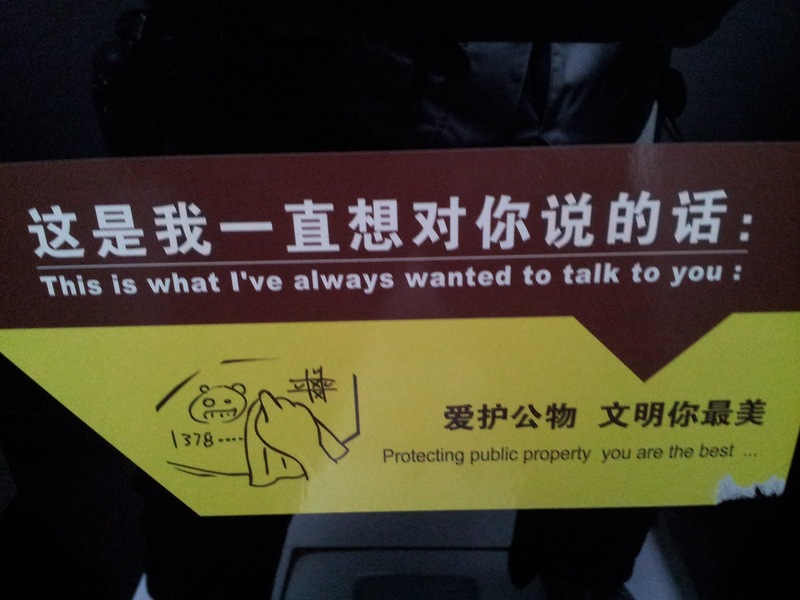 I think everyone who goes to China enjoys the signs. My favorite is "urinating in the pool, you are the best." 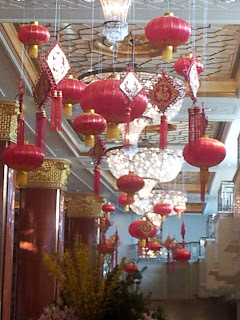 There were red lanterns everywhere. 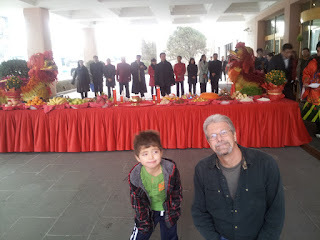 Jim said the Chinese New Year is also called the Spring Festival even though it didn't feel very springy. On Sunday a bunch of our group went to a festival in the city. We were too tired and didn't go. If I had it to do over I would have gone. Don and Sean went swimming and I went to the grocery store in the mall and started packing. 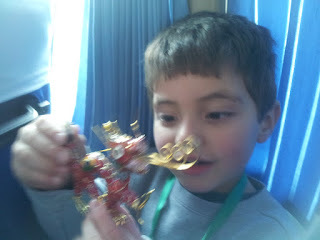 Sean and his dragon ornament. 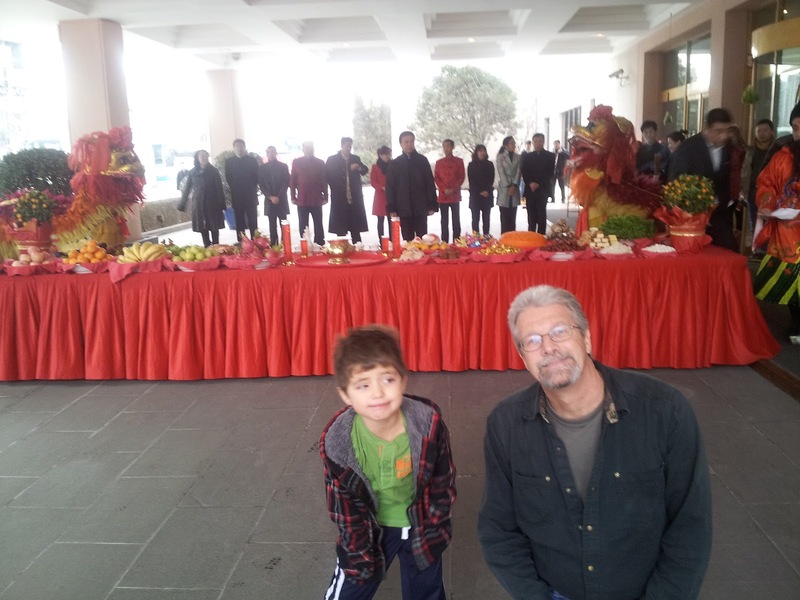 As we were leaving the hotel they had a New Years celebration. There were tables of food for the dragon. Gotta keep that dragon happy! Seeing this picture reminded me that we went to a fabulous Peking duck dinner, so yummy. I made a video though it doesn't do justice to the volume. There were thousands of fire crackers going of and drummers drumming. It was awesome. I seem to use the word awesome a lot to describe our vacation. We took a rickshaw through Beijing 's old Hutongs (narrow ancient ally ways). These neighborhoods are over 600 years old. The emperors of China used to live in them. Until the 1980's when China became open to the rest of the world Beijing was made up of these type of neighborhoods. Now most of Beijing is high rises. 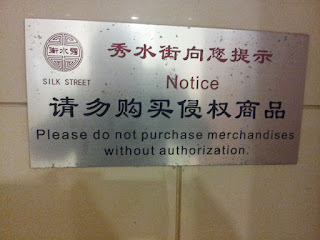 We shopped on "Lotus Lane." We ate dinner in the court yard of a local family. Well, we didn't actually eat in the court yard we ate in their dining room. Four families share the courtyard, kitchen, dining room and bathroom. This is the street we shopped on. I bought a couple of souvenirs. I liked this street because the prices were fixed. I am not a fan of shopping (unless it's coupon shopping at Walmart) so shopping and arguing over prices is not fun for me. Other's in the group really enjoyed haggling over prices. Speaking of Walmart. I would have liked to visit one in China. We drove past one and part of the signage on the building says "Walmart: A pretty store." The post office. I loved all the red doors. It reminded me of a history book. Hm, maybe because I've seen them in history books. A market we passed on our rickshaw ride. One of the alley ways. Part of our tour group. This is the home we ate lunch at. The grandfather is a famous artist. He painted all the pictures on the wall. Hey chicken get out of my way. 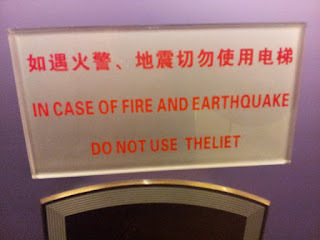 The Beijing Trader hotel is a very nice hotel. In the information it said breakfast was included in our stay. I was expecting a continental breakfast like you get at a Best Western in the U.S. This breakfast was like no other breakfast I've ever had. Sean can't wait to get up in the morning and go to his favorite restaurant. He tried lots of different foods. He said he didn't like seaweed until he heard Ella (another little girl there) say she loved it. It was interesting Sean realizing our relationship with all the people in our tour group was short lived. When we said goodbye to Ella and Jim (our tour guide) Sean said "I will never see them again." We told him he was probably right but who knows. When he is older he can exchange email addresses with friends but five is a little young for that. The walls in the restaurant. I thought it would make a great food storage decorative wall. Don said "that food is not for eating" I said "that's beside the point, it looks good and it's useful." Steamed bread, some plain some stuffed with meat, bean paste or vegetables. So yummy. A miso soup bar. Who knew such a thing existed. Row after row of western and Chinese food. Spreading the bean paste on to the dough. I will miss these breakfast!!! I will probably dream about them. Yes, I am smiling. No, I won't be smiling when I look at the scale. I'm not even sure where we went this day all I know is it was cold and miserable. So cold that the second stop we stayed in the bus and skipped whatever site the rest of the group was seeing. While sitting in the bus we spied a McDonald's which was good because in addition to being bone numbing cold the food we had for lunch was bad. 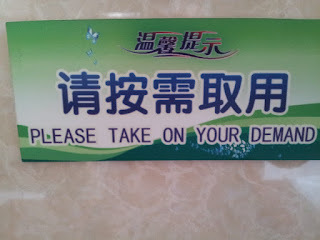 humorously bad, they just kept bringing us plate after plate of dumplings. We were all laughing so hard. It was a memorable lunch. Our tour guide said it was a famous dumpling house and dumpings are part of the New Year festival. No one in the group will ever look at a Chinese dumpling without thinking about that lunch. They even had a dumpling stuffed with tomato's and eggs. There is a Pizza Hut, KFC and 7-11 every other block in this town. McDonald's had fried chicken and fried rice other than that it was the same. The McDonald's did have a squatty potty. That made me laugh. They call New Years, the spring festival. I thinks it's a premature spring festvial cause dang it is COLD! The air was good while we there so the mask are purely for warmth. 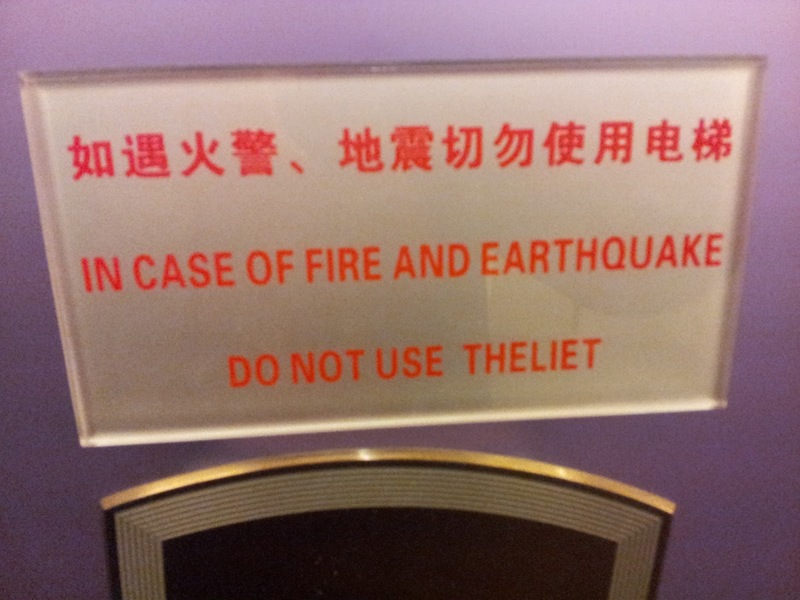 We were worried about the air and came prepared but it was not a problem. The air was about the same as it is in Utah. 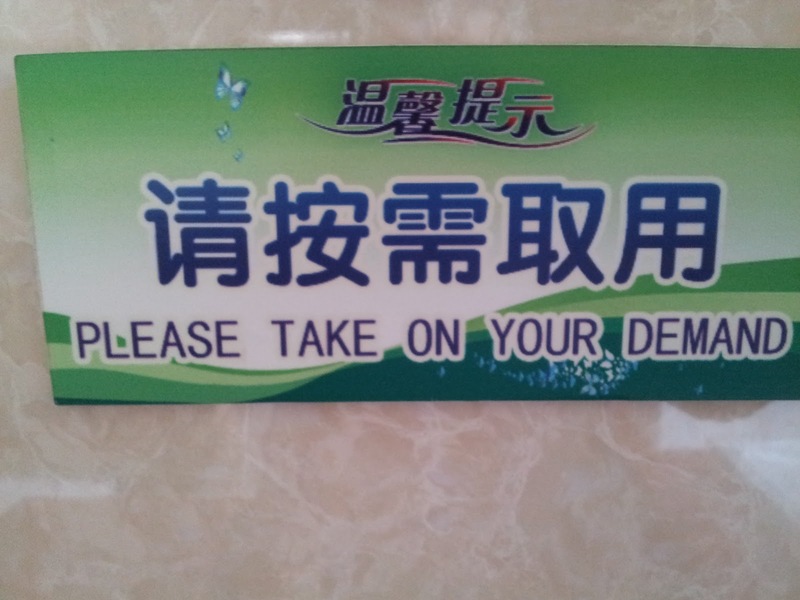 That's not a complement to China's air. Sean, running for the arches!! "Do they have happy meals?" We visited a market where you had to argue over prices. I don't like shopping so shopping and having to haggle for prices is really not my idea of a good time. I did get some cute baby clothes. I think this place was called the Temple to Heaven. This is where we froze. Everyone on the tour said this was a miserable day. It is fun to watch Sean travel. Seeing the world really expanded his horizons and gave him a sense of confidence. He knows three sayings in Chinese, hello, thank you and Happy New Year. It's cute to see the response he gets when he speaks Chinese to Chinese people. They are so amused, you would think Sean had spoken full sentences. They just think it is so amazing that this little American boy can speak any Chinese. They always smile and touch him. If they are with other people they turn and tell them what Sean said. Sean also made friends where ever we went. This little boy is named Roland and his mom works at the Pearl factory we visited. When Sean walked in the door this little boys eyes just lit up. The next thing you know he and Sean were in a back room playing with cars. Roland taught Sean how to count on his fingers in Chinese. They don't use two hands to count to ten they do it all on one. This was the highlight of Sean's day. This little boy lived in the red door district. We ate lunch at his parents house. He and Sean played Thomas the Train. Sean at the prayer wheel. The most remarkable experience was Sean at the Lama temple. It is a Tibetan lamasery located outside of Tibet. Because it was a temple we couldn't take pictures inside the buildings but it was amazing. There was a 55 foot high statue of Maitreya (the future Buddha) carved from a single block of sandalwood. It was a sight to behold. Sean is very interested in religion. I find that strange for a five year old. Sean wanted to know who Buddha was. In one to the temples there were 200 monks chanting. It was surreal. The temple has open walls so it was freezing. The monks sat at tables in heavy robes with little green lights over their books and they chant. At first Sean was scared. Don told them what they were doing and why they were doing it. Sean said his teacher told him there was only one God. Don told him lots of people worship lots of different Gods or powers. Sean said that the God in his heart was not Buddha. How insightful is that for a five year old. Sean watched many locals pay homage to Buddha by burning incense and bowing. It was one of those moments that I was glad he had the opportunity to experience. He could watch it on TV or read about it but it wasn't the same as actually smelling it, hearing it and watching it. Simply put: We are the best! We've been teaching CNA students in Utah for over 15 years. We do it because we love it! We consistently have the highest pass rate in the state. Our students learn what it means to be a great aide and many go on to become great nurses, doctors, physical therapist and teachers. We teach because it is what we love.